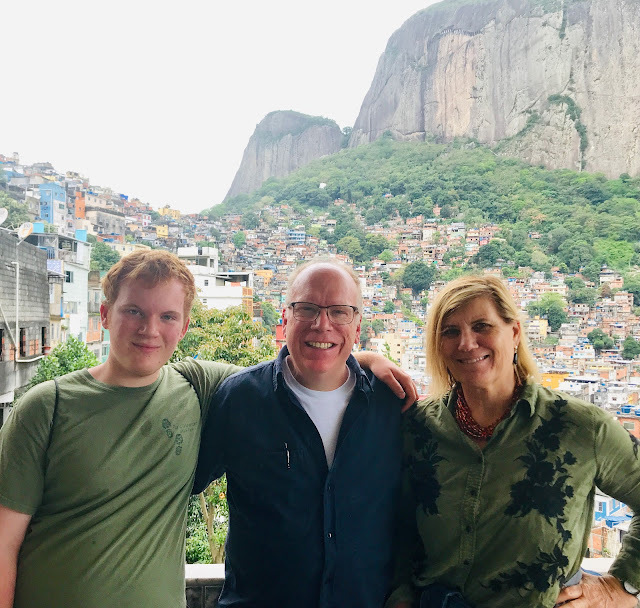 On a balcony in the Rocinha favela--the largest one in Rio. 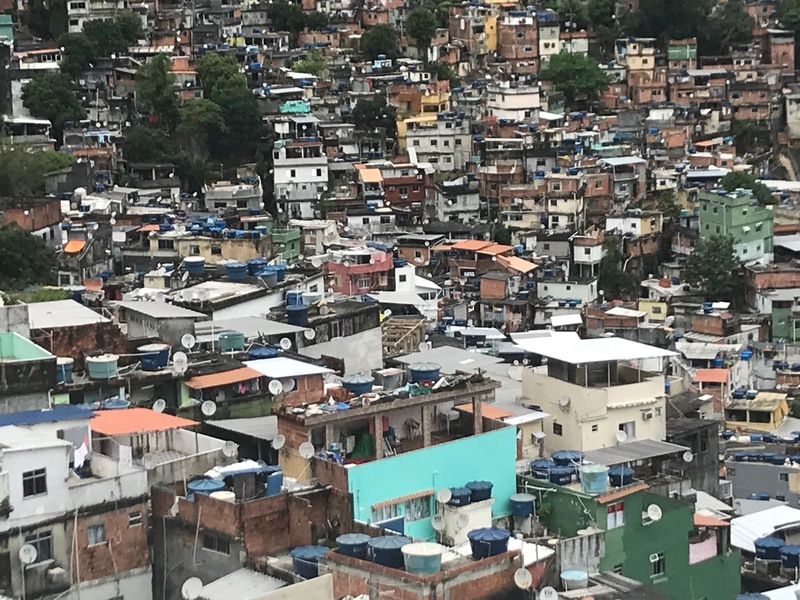 As a sprawling backdrop, the favela is beautiful with much artwork and color, but up close there are some societal problems. However, the residents handle it with grace and clever innovation. 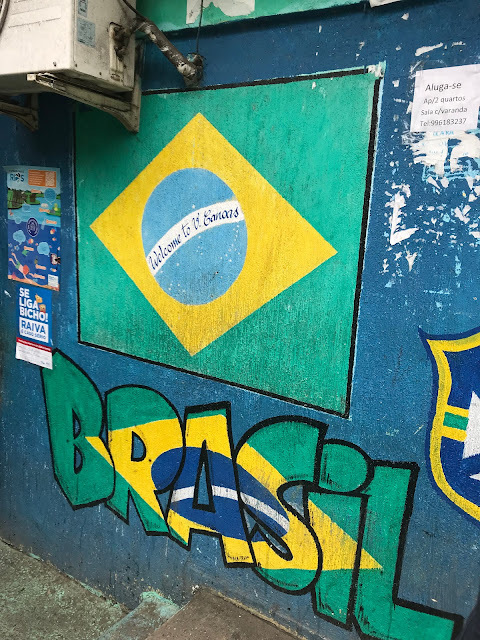 I just returned home from a trip to Brazil, specifically Rio de Janiero and Sao Paulo. Rio is probably the most beautiful city I have ever seen. People in Rio say, "Man made Paris, but God made Rio de Janiero." 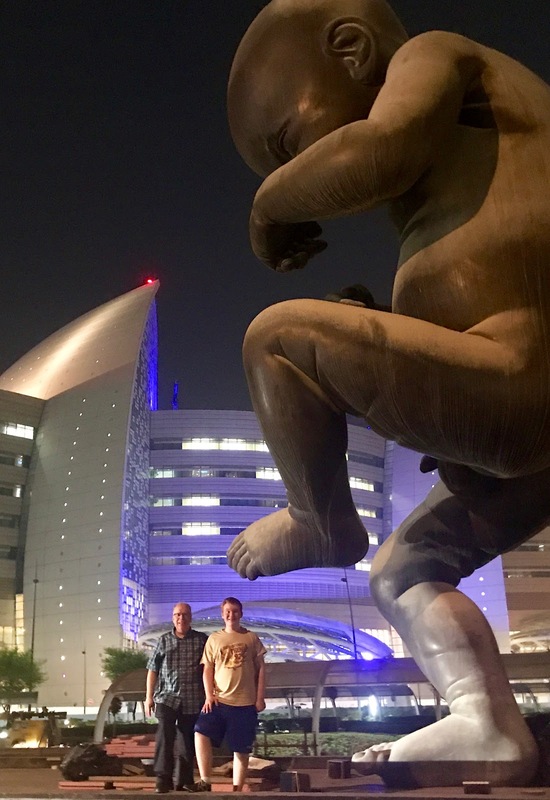 With the Christus Statue standing on the highest peak in the city and frequently draped in clouds, it brings a prominent message of hope below to a city who is struggling (On October 28 there will be the heavily contested presidential elections). The long curves of endless beaches with lush, green mountains like chocolate kisses dropped on the shores around it, are breathtaking for chlorophyll-starved eyes like me who live in the Middle East. Despite some of the political problems in the aftermath of World Cup 2014 and the 2016 Olympics, Rio grabbed my heart. The Portuguese people seem to have an easy, extra sense of rhythm. Music like Samba and Bossanova (Listen to some Brazilian jazz above) bring an air of smiles and sways to everyone. I don't think I have ever heard so many people singing in the streets, on a boat, in a cafe as I did in Brazil. The eclectic history in this country of peoples from Africa, the Caribbean, Europe, North America, and even Asia come together in the music. And of course, soccer is a passion that everyone shares. Pick up soccer games are everywhere. But one thing I sorrowfully noticed: not everyone can seamlessly enter into the areas I experienced in their city. 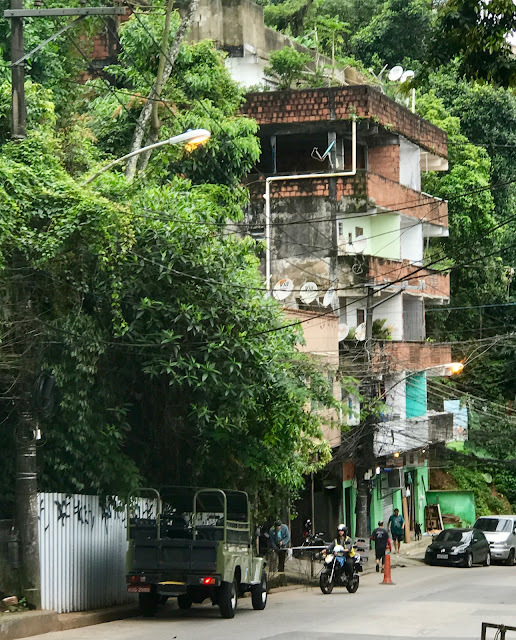 In fact, many do not ever exit the favela or community they live in. 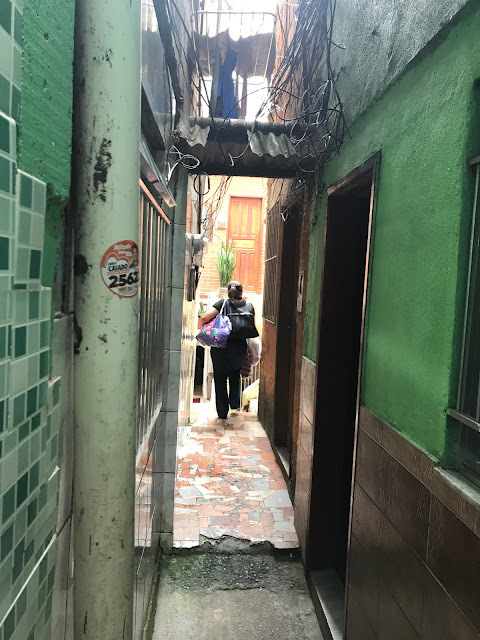 Going inside a favela (The Portuguese word for ghetto or slum. About one in five of the residents in Rio live in a favela), I still heard the beat of beautiful music. It did not stop at the entrance. In fact, the percussion punctuated the buzzing chaos inside the crowded, piled up homes--as you can see in the youtube below. 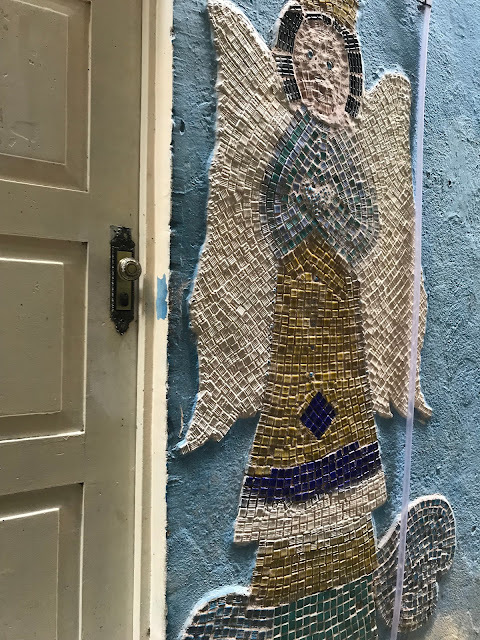 As we wound around the streets and climbed the narrow stairs, I wondered how the elderly and disabled managed. Allys were so narrow that I wasn't sure how furniture and appliances were brought up to the highest levels. But people seem to manage as they go about their lives--going to school, church, the bank, and hundreds of family-owned shops. Life does not stop in the seeming chaos, but there are people who try to make it flourish--even with very little on the table. 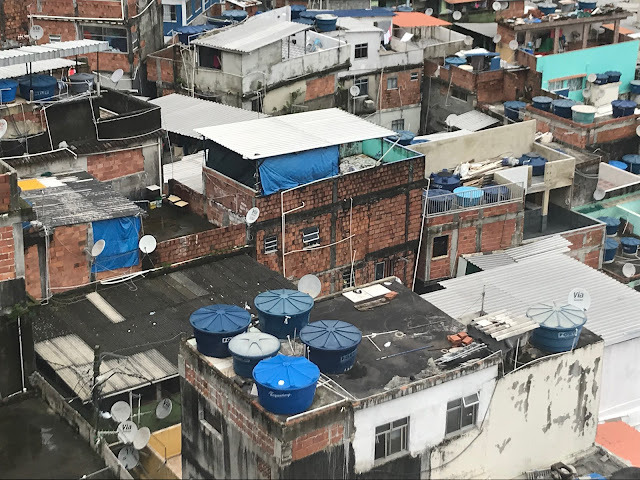 Many residents prefer to stay in the favela since it is expensive to travel outside unless they work at the hotels, restaurants, or in construction in Rio. But the music plays on. 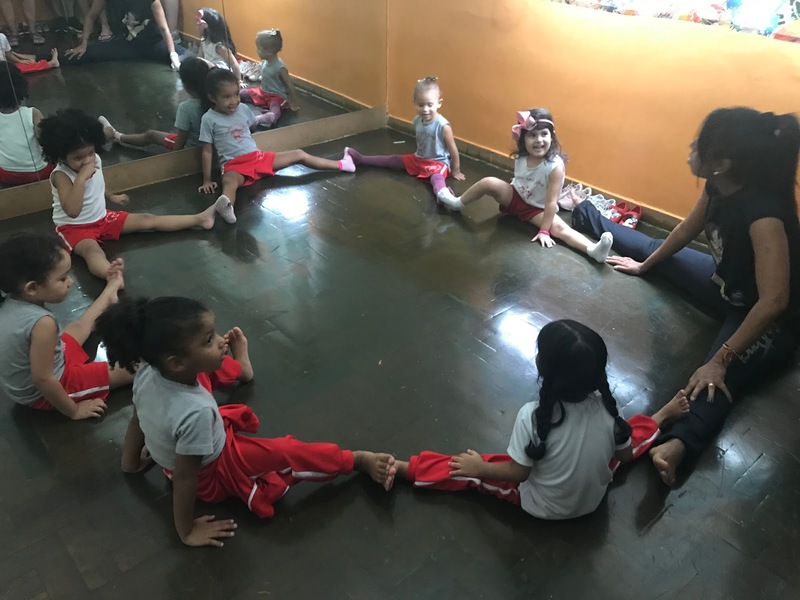 In fact, I even got to go to a preschool age ballet class at a school. What I saw was resilience, and tenacious courage to still play the music that pounds in their hearts. There were colorful graffiti that enhanced the beauty of the existing buildings. 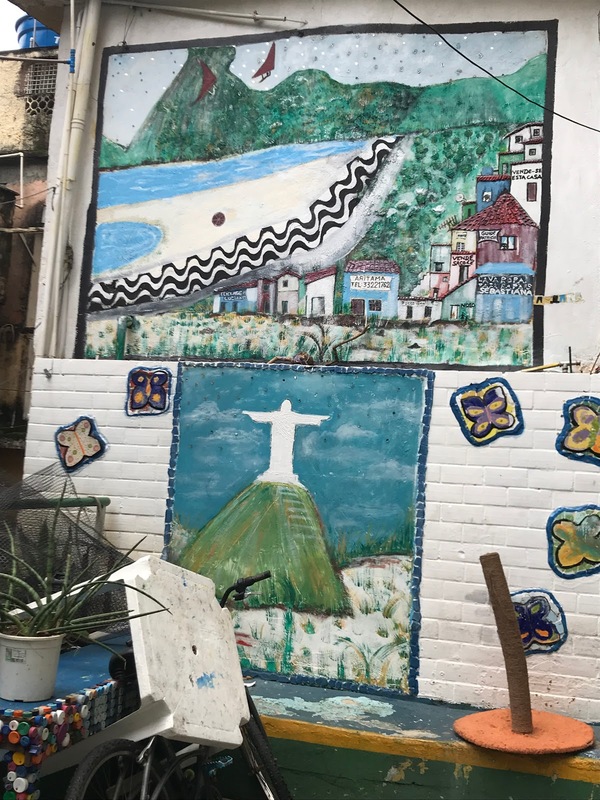 In a place where hope could die, the Rio favelas know how to dance, sing, and do art--even when their world has some major unmet needs. A youtube tour of the largest favela in Rio called Rocinha where we visited. If you are in Rio, go on the original favela tour owned and begun by Marcelo Armstrong. He was the first tour guide to get permission to take tours 26 years ago in the favelas. 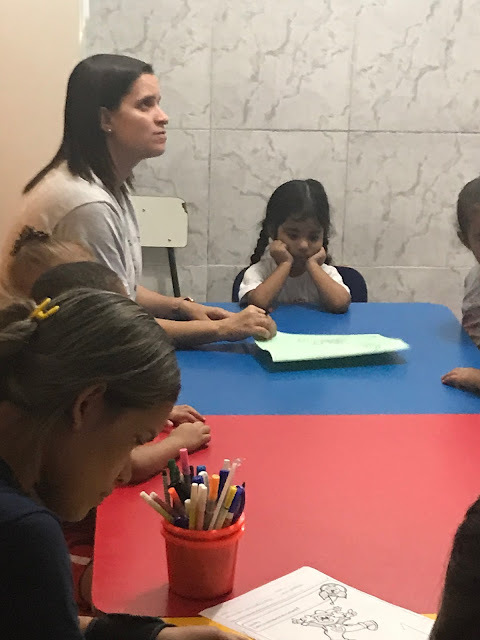 You go inside a school, which the favela tour helps subsidize. It brings another glimpse of life you would otherwise not see. The best part is meeting some residents who keep living their lives with tenacious hope. Sometimes the houses are built five or six stories high on top of each other. The workers who build them are not trained in engineering or architecture, but they know how to build. Most of the favela residents came into cities like Rio in the 1940's from the rural areas for employment. They couldn't live in the cities so they just started to build their own. Many have lived there for generations, and some are even middle class. They choose to reside in a place they call home with neighbors who help and assist them. 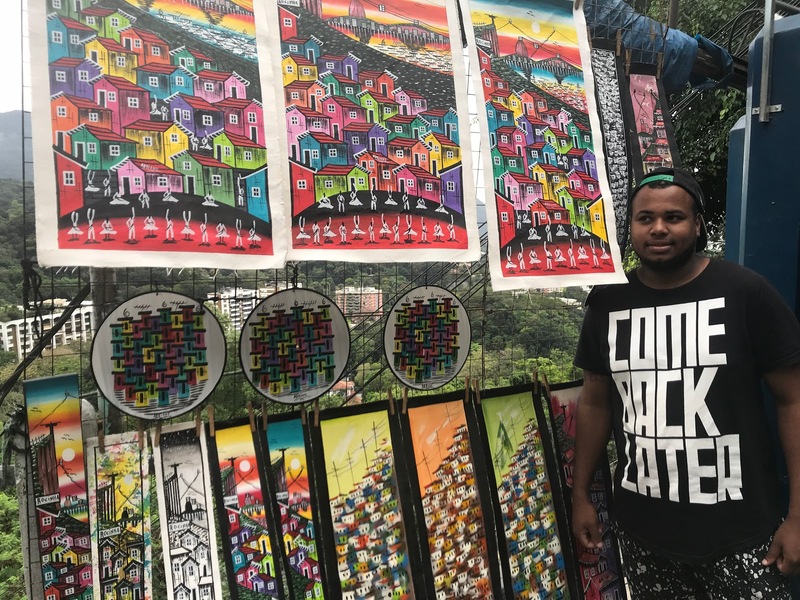 Artists in the favela paint to sell to tourists like me. They do well with their creativity. The round paintings in the middle are made from old records. Many walls on homes, in the alleys and businesses, had the handprints of artists. There are water barrels on top of the roof to give water. They definitely know how to be resourceful. 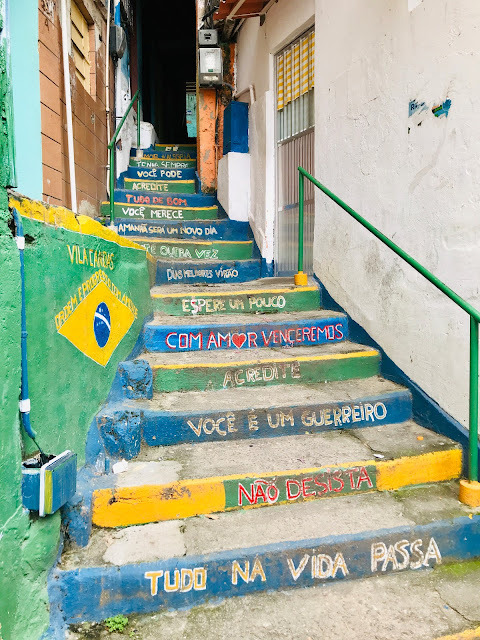 My personal favorite--each stair giving a Brazilian saying. Color distinguishes and personalizes a home. 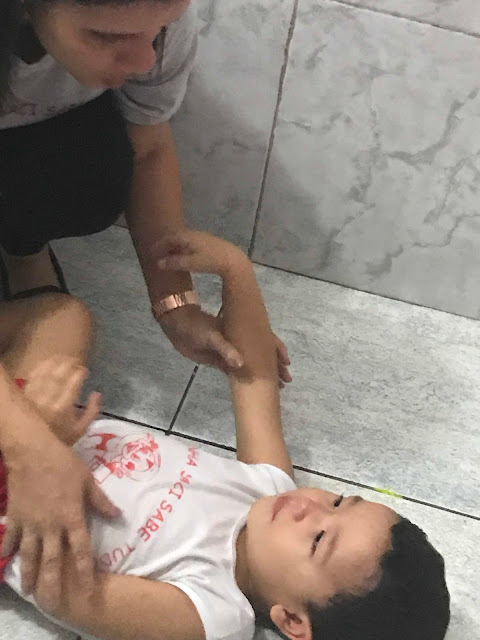 A teacher trying to deal with a child she thinks may have autism. Ballet class. Wow! We had some excited little girls dancing in front of the mirror. A business street. There is only one or two main thoroughfare streets. The rest are very narrow allys. "Bend over, but talk straight." "You will see many things in Morocco that surprise you--even donkeys flying." Winston Churchill described Marrakech as "the loveliest spot on Earth to spend an afternoon." 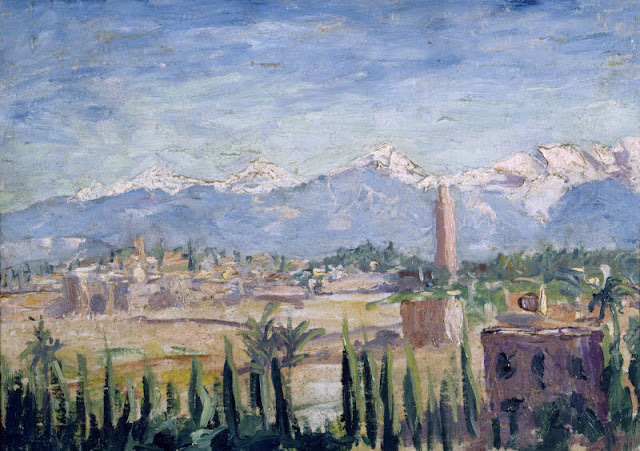 He stayed about six months (six different trips) of his life here on painting expeditions--trying to capture the light and beauty of this place he called the "Paris of the Sahara." When he and Roosevelt met in Casa Blanca in 1943 to figure out how to end the war, he coaxed the ailing American president to come to Marakeesh for just two days. The reason? 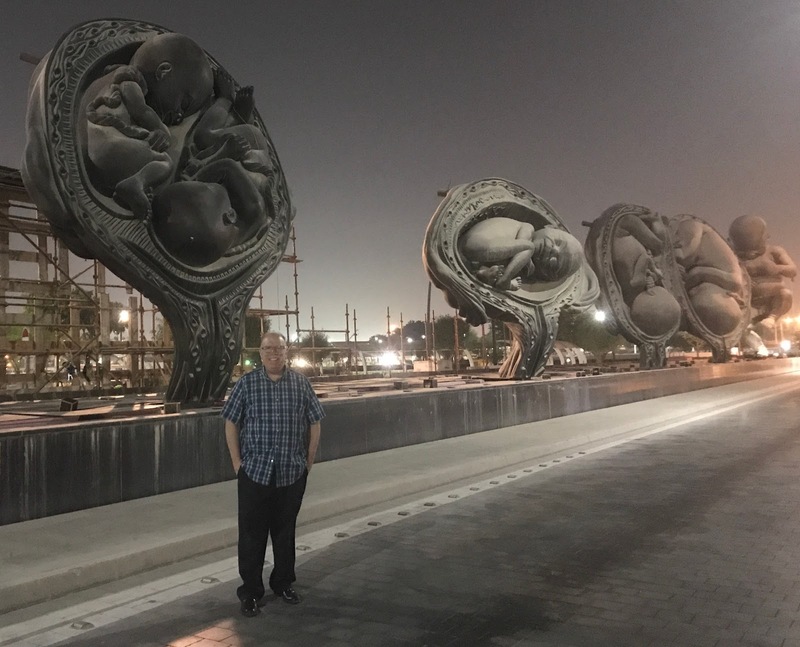 To see the light change colors in the sunset and experience the narrow alleys inside the red walls of the medina (the large sprawling market). Marakeesh sparked him to be a better artist (Yes, he was indeed a great writer, leader, AND artist). Morocco charmed him for about three decades of his life--from the 1930's until his last trip in the 1960's. Churchill was right. Marrakech is one of the loveliest spots on earth. You feel like an adventure is brewing once you step off the train in Marrakech. But to go inside the red walls of the medina and see the people of this desert treasure is, even more, exhilarating My blog about Marakeesh Craftsmanship in the Medina To trek and meander the narrow alleys of the many villages that make up the medina allows you to see Moroccan humanity up close. You can smell the cooking, admire the craftsmanship, laugh at their jokes and antics, and be amazed by the creativity with just a few materials. As you walk into the medina, there is a distinct sense of many communities working and living closely together--sometimes for generations. Vendors brag their ancestors haggled with would-be customers in their same space--even hundreds of years before. The communities living and working inside the medina are fascinating to watch and observe. For example, many still share an earthen oven to make their daily bread together. The dough is made every day, sometimes twice daily, and brought to the oven to bake. Rubber stamps are embedded in the round, flat, crusty bread so they know which family it comes from. The medina is divided into quarters--each has a mosque, hammam (bathhouse), communal bread oven, and a madrassa (an educational institution). Just choose a direction. Maps won't be helpful. You have to navigate with landmarks and all your five senses in the "medina maze." You will feel like you are in an Indiana Jones movie. Have fun! Walking around the medina at night. Creative vender in the medina. He wrote signs in English to direct everyone to his shop. Arabic pastries are usually sweet and syrupy. I am endlessly fascinated with spices. Notice the beautifully carved doors to the shop. A woodcarver shop. He has on the authentic dress of Morocco for men, a wool tunic with a hood. More spices... and also for medicinal purposes. Vendors wear white coats to show they are here to assist your ailments. Westerners know pills, but not this kind of herbal apothecary. It is fun to wander in to smell, rub herbs together in muslin. You can find argon oil, perfumes, and the exoticness of North Africa. You can find sandalwood, black cumin seeds for sinuses, frankincense to help you feel calm, etc. If I could choose, I would say I like the pottery shop the best of all. I wish I could have brought back dozens of geometrically colored plates, bowls, and tangine pots. Moroccan vendors like to make their wares beautifully arranged to make it more appealing to the buyer. A family helping their grandma get on a scooter. Elias going to bed on his birthday with a the traditional Moroccoan hat called "the fez"--named for the city of Fez. It was popular during the Ottoman empire. Some people were all dressed for their Moroccan holiday--and fit in perfectly with the crowd. The older men still wear these loose tunics, but the younger men generally wear t-shirts and jeans. The bread of Morocco--flatbread about an inch high called khobaz in Arabic. Since Moroccan people consume so much bread (sometimes making it twice daily), you can see many vendors speckled around the streets and medina selling khobz. 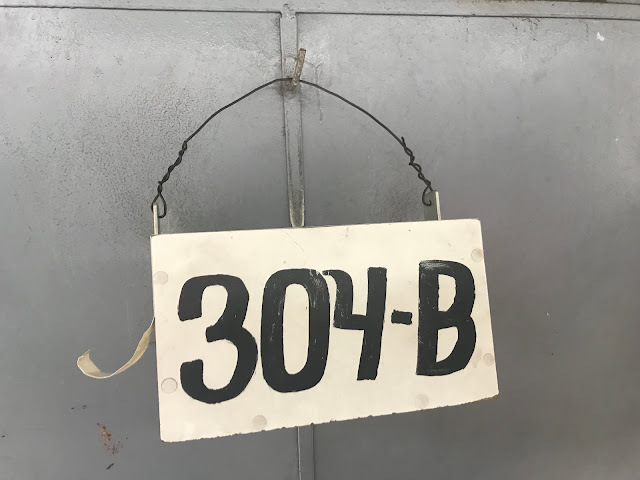 Another way to use humor and personalize your accessories is made from the vendors. You can write anything you want, in other languages too. Bargaining with the vendor of the wedding blankets. The captivating doors and statue inside of this rug shop just beg you to come in. Wandering the medina and its labyrinths are not for the weary. The walk home is filled with stories and adventures of a very full day. Senses have peeked and you feel like you have just met with a whole new array of humanity. And a few more friends too.